Py-CU, along with the CU Coffee Shop Coders and CU.NET will be hosted by Granular at the Research Park. You can RSVP via Meetup. Granular’s tech stack and how we use Python (spoiler: a lot). He will touch on our use of Pyramid and SQL Alchemy, and talk about tips for maintaining a large codebase in Python. Deep learning has become one of the hottest topics in computing in the past few years. Neural networks are not a new topic, but with the recent advances in computation capacity provided by hardware accelerators, in particular GPUs, they have gained new popularity. In this talk we present some of the concepts behind neural networks and deep learning, and then shift to the performance aspects of available solutions. We will finally focus on Tensorflow, an open source deep learning package, and provide a hands-on demo using it that uses the python language. Granular is an agriculture software and analytics company dedicated to helping industry leaders build stronger and smarter farms. With cloud, mobile and advanced data science technology, the Granular platform makes it easier to manage a large farm and use data for critical business decisions. Granular’s rapidly growing network of farms in the US and Canada is finding new ways to profit from aggregated data, expertise and market power. Granular is headquartered in San Francisco with an office in Champaign, IL and backed by Andreessen Horowitz, Google Ventures, Khosla Ventures, and Tao Capital. We’re changing our hack session/project night/open hours times! They will now be on Saturdays, 1 - 3 PM, at the Makerspace. Here are Elizabeth’s slides on her lightning talk, How to Assess Programming References. From my perspective, computer programming has always been a communal activity. We need other people to help us solve problems, link us to learning materials, or work with us on larger projects. Very often programming appears and feels very solitary when our community is based solely on websites like Stack Overflow and Reddit or in a pile of books. Sometimes we want to have some face-to-face interaction so we can feel like we are part of a community. That is what Py-CU provides. 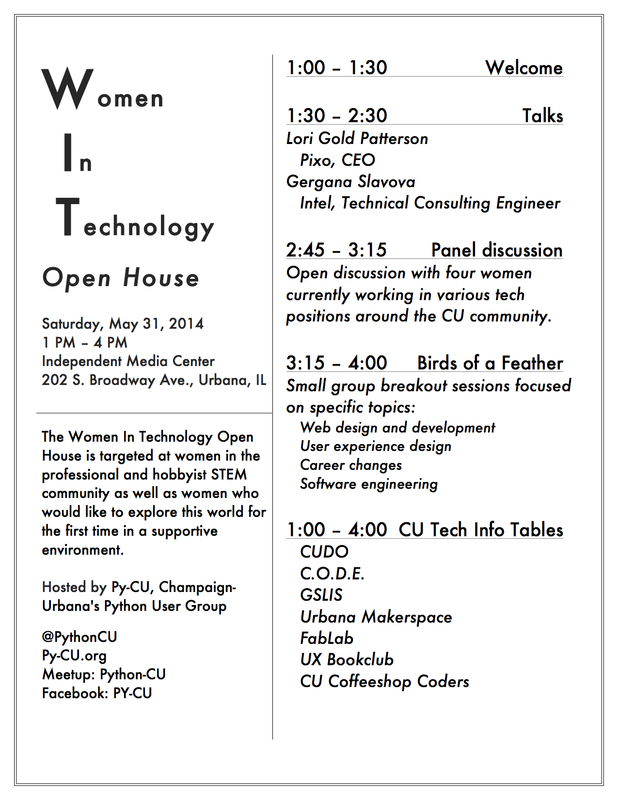 We are hosting our first experimental Women in Technology (WIT) Open House event on May 31, 2014 from 1:00pm to 4:00pm at the Independent Media Center in Urbana (202 S. Broadway Avenue). This informal event is targeted at women in the professional and hobbyist STEM community as well as women who would like to explore this world for the first time in a supportive environment. It will consist of a schedule of mini talks, a panel of representatives from CU tech groups, and small group breakout sessions focussed on specific topics. We’re now meeting once a month rather than once every two weeks, since meeting frequency and the amount of content we can offer per meeting are inversely correlated. Our venue is once again at the Champaign Public Library, in a room off the coffeeshop area in the lobby. We’re not guaranteeing that we’ll stay there forever, though – we might even meet in different places each month, just for the hell of it. Help us celebrate our first birthday! Time: February 1st, 2014, 6 - 9 PM. This time last year, a bunch of random people came together and decided to start a Python users group and called it Py-CU after Nadia Karlinsky posted an ad in Craigslist about meeting fellow Py-CUrious folks. Attendees are encouraged to bring eats and drinks of any kind though this is not necessary, especially for folks who have been wanting to come to one of our events but have been somewhat shy about doing so. We’ll also play games such as Cards Against Humanity and anything else people will bring. There will also be a lot of hanging out and getting to know each other. So stop by! We would love to see you! Just a quick reminder that we’ll be suspending our regular twice-monthly general meeting schedule until after the holiday season. Our next meeting will be January 6th. At that point we’ll start meeting at the Makerspace each time, since we’re now officially affiliated with the Makerspace and have full use of the space. Watch the events section for the meeting’s agenda. See you there! Elizabeth’s poster has been accepted for PyCon 2014 in Montreal! Once students are inspired to learn Python, what does the community have to offer to facilitate that education? This poster discusses educational tools and services for the Python novice with a focus on students outside of a mainstream computer science degree program. Come share your story of learning Python! Programming and computer science education have quite a few barriers to full inclusion of researchers who could benefit from acquisition of those skills. The desire to learn is often seen as the largest barrier for entry into computer science education, and many programs and initiatives are designed to encourage prospective students to move beyond it. In most cases those students will be entering into a formal and structured learning environment, but what about the students who are outside the mainstream computer science educational system? Students may be from academic domains that do not traditionally use programmatic tools for research, lack the funds to enter into college coursework, or are a working professional trying to gain new and marketable job skills. One of the most obvious advantages of learning Python is the ease and low cost of access to begin development. Setting up a computer for Python development may be accomplished at zero cost in software or tuition. Additionally, many tools for learning are available for free or low cost, but students outside the formal classroom experience often have to rely on word of mouth and dumb luck to discover these tools. This poster has two goals: first to educate the conference participants on the resources available to new students of Python and to encourage them to give back to their community by participating in their local Python organizations. 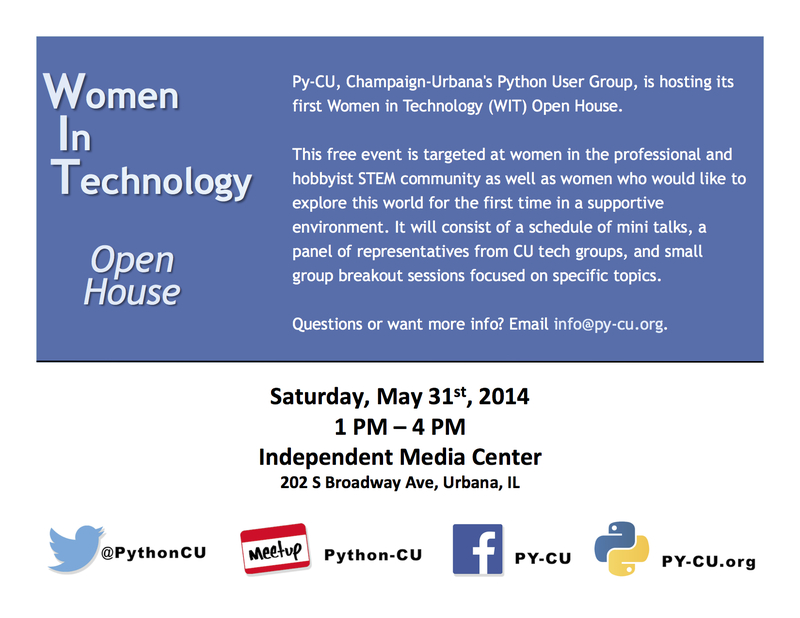 The content of the poster will explore the advantages and disadvantages the Python community offers students who are learning outside of a mainstream degree program, summarize some of the existing tools independent students may find helpful, and explore the outreach programs used by the Champaign-Urbana Python User Group (Py-CU). The interaction with the PyCon participants will be the core experience. Developers are encourage to share their stories of learning Python with the poster presenter. Understanding of how developers learn their craft, and what they found helpful and encouraging in that process, is vital to have on hand in order to design and facilitate programs that can give the most back. We won’t be holding hack night on 12/24/2013. Happy holidays!